I’m sharing more of my workwear picks below! Happy Monday, hope you had a nice weekend! Yes, such an outfit never fails for work! Looking absolutely gorgeous and so elegant top to bottom! I’m loving your skirt and bag! You look chic and pretty 🙂 Love those sunglasses. Absolutely in love the with color scheme and silhouettes! Great outfit! Really like the high waisted skirt. It gives the perfect ‘fit! So classic and I love all the textures. I just went through my closet and purged a bunch of white shirts…time for a restock! I love that minimal vest, such a gorgeous look! this outfit looks great. I would even wear my lv damier azure print. You always put together classic and classy outfits for work. Love this one! Great texture on that skirt. Love the skirt!! Looks so chic! I think this is one of those examples of absolutely not boring work outfits, that totally ruin the stereotype about them. 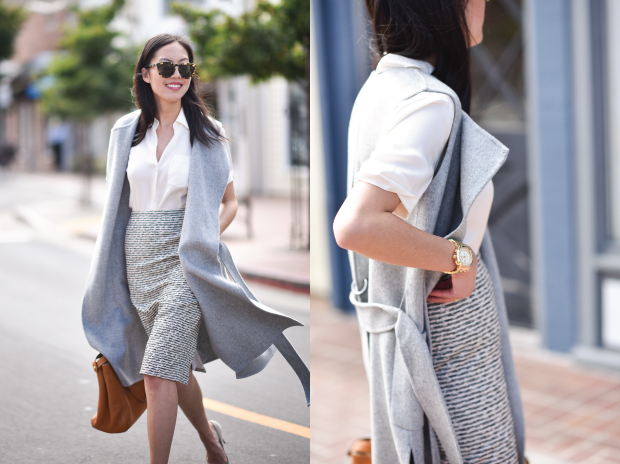 Workwear can be elegant, yep! I love how simple and stylish this look is, the skirt and the vest are so pretty. Very nice look! I like the sleeveless jacket a lot!